Ceratophyllum Linn., Sp. Pl. 992. 1753. Gen. Pl. ed. 5. 428. 1754; Hook. f., Fl. Brit. Ind. 5: 639. 1888. Characters same as that of the family. Establishment of the species in Ceratophyllum is rather difficult due to wide distribution and variations due to adaptations of the plants. Specific differentiation is mainly based on fruit shape, texture, wings, number of spines and lateral projections, which seem to be very variable. In addition, there is variation in flower colour, in the number of terminal horns (1-2) of the leaf segments, perianth and stamens, presence and absence of glandular processes and lateral pocket of the stigma. 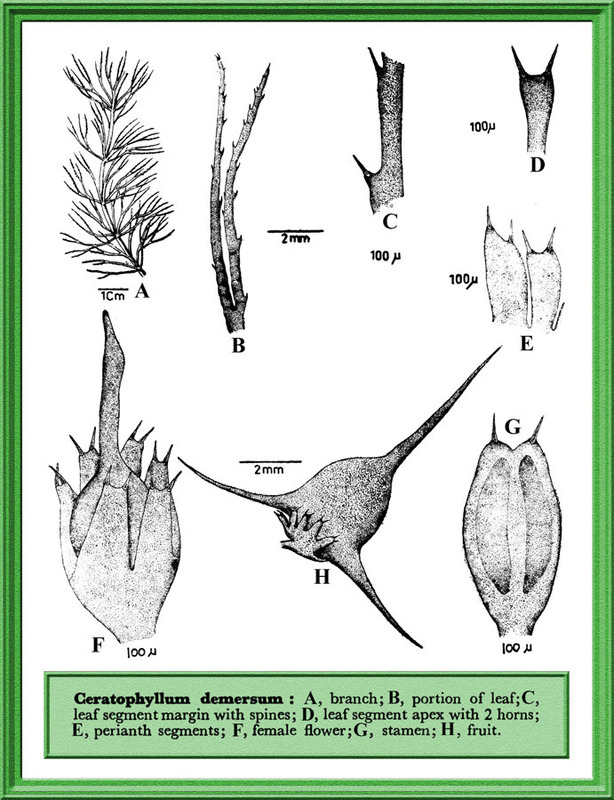 However, some authors recognised various groups or species, whereas others treated, at least, all the Indo-Pakistan material as one species, Ceratophyllum demersum, and considered other species or groups as forms, varieties or variants, based on maturation phases, especially of the fruits.